This video was posted on Youtube by one of the past participants. It shows the small group presenting a dance routine for their Japanese brothers and sisters. Labo camp could be one of the highlights of your trip to Japan. It is a typical Japanese-style camp, which will be a new experience for you! The group emphasis of all aspects of life at Labo camp will give you an insight into the roots of Japanese society. You will also take part in outdoor hikes, indoor lodge activites, and a special program for international students. This small camp is on Hokkaido island where it is cool and surrounded by natural beauty. This camp is usually held at a mountain ski lodge. It is known for it’s wildflowers and cooler weather. “Laboland” is Labo’s flagship campsite. Over 1,000 students attend each session. The waterfall trek and hike to the summit of Mt. Kurohime are popular outdoor courses. Enjoy the mountain beauty of a ski resort in the Chugoku region. Labo camp lasts for 4 days and 3 nights. This includes travel time to and from camp. During the summer there are a number of camp ‘sessions’ at each campsite. Your host family will decide which camp you will go to, and which session you will attend. They will make all of the arrangements for you and your host to attend camp together. In many cases your entire Labo Party will go to camp together — with children as young as 3 years old on their first trip away from their parents! The Japanese do not view camp as an opportunity to simply relax and have free time. Their time at camp is short, and Japanese camps are very expensive. So the participants want to get the most out of their time at camp, and there is a busy schedule planned. There will be a lot of children at camp — up to 1,000 at some camps! — and many will be young children on their first trip away from home. With so many young campers, and given the Japanese tendency to plan everything super-well, you will probably find Labo camp to be much more strictly organized than camps in New Zealand, with set times for certain activities, and little room for changes from the schedule. 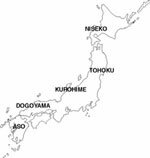 At Labo Summer Camp you will meet other young people from all over Japan and around the world. Making new friends is an important part of Labo Camp! There is a busy schedule planned at camp. such as mountain climbing and nature hikes are popular, as are visits to local crafts-people and historic attractions. There are many different levels of difficulty — from picking flowers in a field (for the youngest kids) to quite challenging mountain climbs. These Activities are a highlight for many Labo members. Practicing and performing Theme Activities (dramas) and Songbirds (songs) is popular, as are getting-to know-you activities and various games. Exchange students will be asked to introduce themselves and talk about their home country. At most camps, time is set aside for the foreign students to get together. College Mates and Interns talk to you about the schedule, activities for the next day, and so on. You will also have a chance to socialize with the other foreign students. During the day you may not have time to do so since they will probably be staying in different Lodges. Where will you Stay?/What will you Eat? 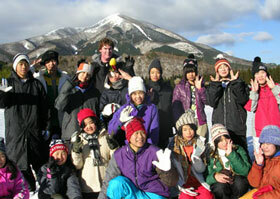 Students will be assigned to a Lodge with about 20-30 Japanese children. This lodge will be like a family during camp. Most lodge-mates will be under 10 years old, but there will be some high-school students and a Tutor or two. A lot of time will be spent in the lodge — playing games, doing self-introduction activities, and of course practicing Labo Songbirds and Theme Activities. Almost all meals are taken in the lodge. Breakfast is usually western-style, with rolls, cheese, juice, and so on. Lunch is often a box lunch, since campers will probably be out on a hike or other outdoor activity. There is always a hot evening meal served in the Lodges. Everybody pitches in to help serve the food and clean up afterwards. At bedtime everybody pulls a futon (sleeping mat) out of the closet, along with sheets and a pillow. In the morning these are put back into the closets so the room can be used for daily activities. In each lodge there are separate rooms for boys and girls, but no private rooms. There may be 10-20 kids in each room.